Selecting the required third-party applications and individually patching each one in Microsoft SCCM is not only tiresome, but it also consumes a lot of valuable time. Patch Connect Plus, our add-on for SCCM, offers an Auto-detect Applications feature, which automatically publishes patches for newly added applications in the network in SCCM. It fetches the complete list of applications that are installed on client machines and notifies you when a new application is detected. Visibility over the updates that are applicable to the network using the Installed applications view. Notifications whenever a new application is added. I'm confused about the applications that are installed on my organization's systems. I have a whole bunch of applications under the Select Applications tab. 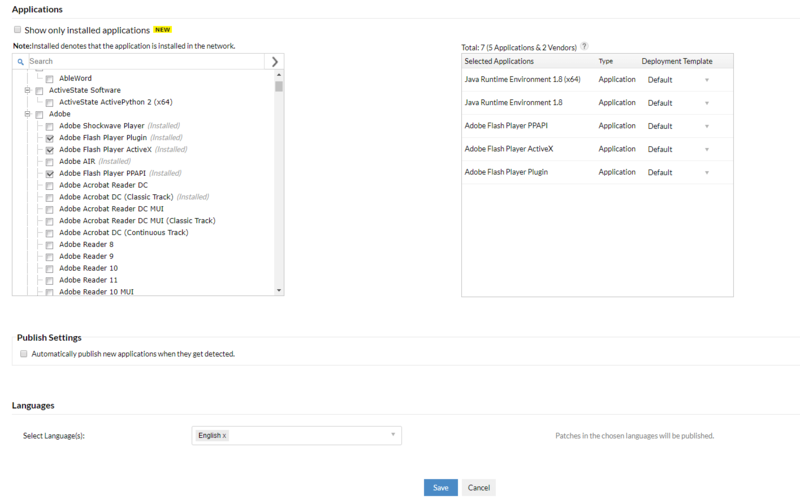 Solution:Select the Show only installed applications option under the Select Applications tab to view a list of applications that are actually installed in your network. Whenever a new application gets detected, I want it to be published automatically. I don't want to search for the application manually. Solution:There is an option under Publish Settings that automatically publishes new applications when they're detected.